When ordering products through the website it will assume a £7.50 delivery charge until you reach the step when you put your postcode in, if you qualify for free delivery it will deduct it from the order. 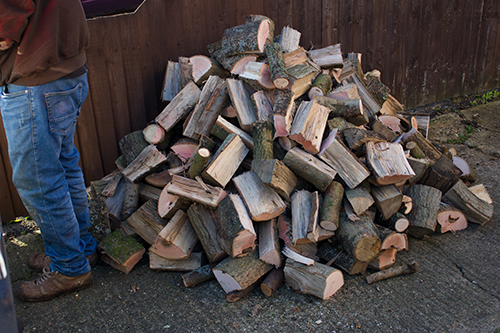 Our woodfuel is exclusively high quality locally indigenous hardwood, the bulk of which is generated from the thinning of ancient multi-stemmed trees. 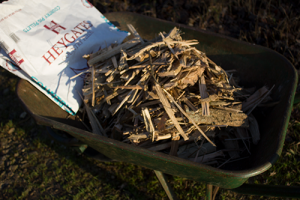 A typical load will comprise at least 80% ash. The remainder may include oak, field maple, hawthorn and/or hazel. One load of logs is approximately 1 cubic yard. Our standard load is a mixture of shapes and sizes cut to 6”-9” in length – approximately 350 logs. Please specify any particular length requirements and whether you have a preference for fatter or thinner logs. Logs are delivered loose to anywhere with vehicle access. Free delivery for up to 5 miles (from MK46 5JH). Deliveries beyond 5 miles are charged at £1 per mile. An extra charge will be made if delivery requires any additional labour eg stacking or manual carriage. The shards and splinters left over from processing logs produces the best kindling you can get. We supply this in 25kg animal feed bags. New for 2017! 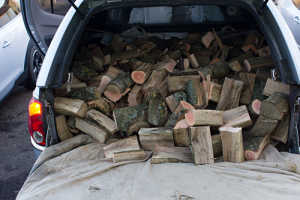 Netty bags of 12 logs, arrange collection from the wood. We are developing a diverse range of traditional woodland produce. The following are only produced on a small scale and so much of the following will only be available in small quantities and/or in season – Fresh & dried gourmet woodland fungi; Country wines (including primrose, elder, dandelion, rosehip); Sloe gin; Quince vodka; Woodland honey; Crab apple Jelly; Rosehip syrup; Bluebell seeds and Moss.